during World War II .
. World War II brought about the largest and most rapid expansion of American Red Cross humanitarian activities in its history. Prior to actual US entry into the war, Red Cross ships brought supplies and medical treatment to needy overseas refugees. Warehoused supplies and first-aid ambulances saw extended use in such places as England, Finland, Monaco, China, Philippines and even German-occupied France and Poland. When the United States declared war, an upsurge of volunteers and war fund drives strengthened Red Cross to an eventual strength of 7.5 million volunteers. The "Three Ds" (Drill, Dependability and Discipline) became the new Red Cross watchwords. Medical clinics, mobile dispensaries and health courses were established throughout the United States. Scrap drives were initiated and civil defense offices opened. ..
.. The Red Cross once again performed Herculean service in recruiting nurses for the armed forces, providing hospital and medical care, procuring and making medical supplies, and organizing morale-building services such as mobile canteen and clubs for the soldiers. At the same time, the Red Cross also responded to home-front disasters ranging from train wrecks and industrial plant explosions to massive fires that caused high loss of life (notably the Boston nightclub and Connecticut circus fires). 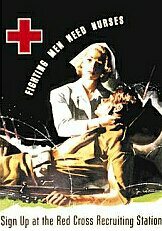 One of the largest and most important Red Cross programs during the war was the Red Cross Army-Navy Blood Donor Service. 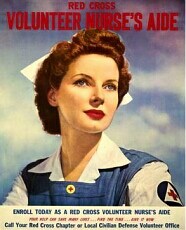 This service was an outgrowth of the Plasma-for-Britain drive in 1940. 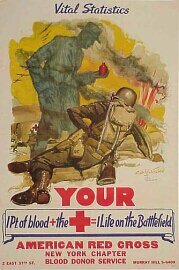 By the end of the war, the massive program had collected over 6,150,000 liters (13 million pints) of blood. This blood was converted into liquid and dried plasma, which enabled lifesaving deliverance to civilians and solders in every Allied-controlled area during the war. ..
.v Not only the military, but most of American society had a policy of segregation in WW2. Therefore, the ARC had an official policy of strict segregation as well as the military. In fact, this policy was so racist that blood drawn from Black citizens during wartime Red Cross Blood Donor Drives had to be marked separately, and could only be used for Black soldiers. Whites were afraid that "colored blood" would poison their bodies and turn them nonwhite, a common fear at that time because of laws against nonwhites marrying white women and so forth. 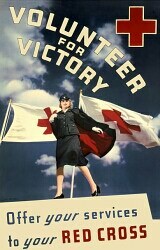 The American Red Cross achieved great success in relieving the human suffering caused by wartime and natural disasters through organized civilian volunteer participation. Moreover, tremendous strides were made toward improving health, preventing disease and mitigating distress throughout the world. The Red Cross spirit of cooperation and compassion played an instrumental part in making the final Allied victory possible on a quicker and more humane scale. 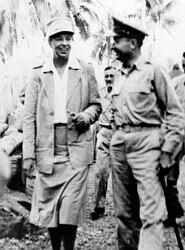 The Red Cross offered relief efforts on a global basis in regions either secured or bypassed by advancing armies. ..
uniform meets Major General Beightler .. Nevertheless, problems remained. One of the great disappointments was the Red Cross continued insistence on segregation, despite the valiant efforts of First Lady Eleanor Roosevelt (herself a uniformed Red Cross volunteer) to change racist policies. Another disappointment was the Red Cross effort to repeat its World War I success in supplying US prisoners of war with care packages. The American Red Cross started a program to deliver food and personal packages to 1.5 million allied soldiers held captive within German and Japanese prison camps. Unfortunately, the International Red Cross was misled by the Nazi and Japanese authorities. For example, they inspected Nazi prison camps on behalf of the Geneva Convention and sent back pictures of smiling captured American prisoners and warm letters to America stating how good the camp conditions were. Many American families were sadly deceived by this and sent packages to their loved ones, only to find out after the war that their men had been seriously mistreated, starved, tortured or even killed. 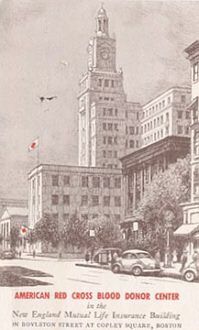 As a result, the American Red Cross reputation after the war suffered from being unfairly judged by the misleading behavior of the International Red Cross.